MEXICO CITY — The United States and Mexico plan to hold ministerial-level NAFTA trade talks on Thursday in Washington, the second such meeting within a week as efforts are ramped up to seal a deal on updating the 24-year-old accord, two sources said. 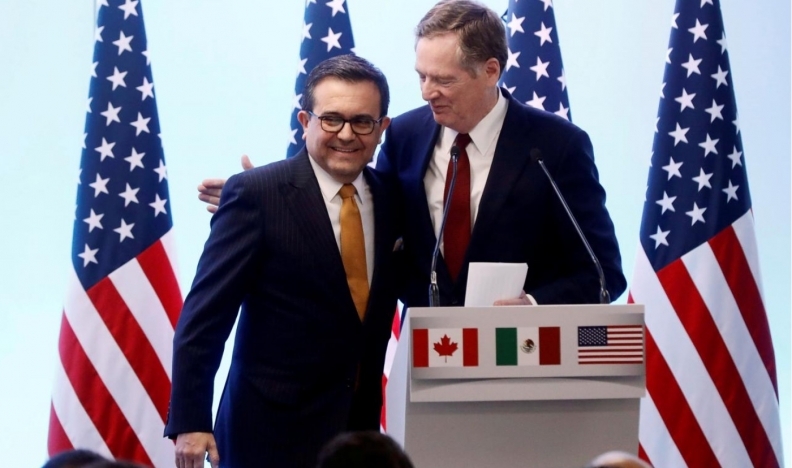 Mexico and the United States agreed last week to step up talks on revamping the North American Free Trade Agreement in hopes of reaching an agreement on major issues by August. A spokesman at Mexico’s economy ministry said there would be technical meetings this week, but said he did not know whether a ministerial meeting would take place. Mexican Economy Minster Ildefonso Guajardo last week held what he described as “constructive” and “very positive” talks with U.S. Trade Representative Robert Lighthizer and President Donald Trump’s son-in-law and senior adviser, Jared Kushner. A spokesman for Freeland did not respond to a request for comment about the NAFTA talks this week. The office of the United States Trade Representative (USTR) could not be immediately reached for comment. Freeland visited Mexico on July 25 and she and Guajardo insisted that NAFTA remain a trilateral pact. Talks began last August but stalled in the run-up to the July 1 Mexican presidential election. That was due, at least in part, to U.S. calls for a so-called sunset clause, that would put the deal forming one of the world’s largest trading blocs up for renewal every five years. U.S. demands for sweeping changes in the auto sector have also been controversial. “There has been progress [on autos].” We are “working on proposals from both” nations, said one of the sources close to the talks. However, Flavio Volpe, president of the Automotive Parts Manufacturers’ Association in Canada, said he did not think there was a new Mexican proposal and that there are still complicated issues between the United States and Mexico. “I saw [U.S. Commerce] Secretary [Wilbur] Ross yesterday say that they’ve got more complicated issues with Mexico than with us. Frankly, when we left the table in May, we were also very close except for the high wage labor content proposal that the Americans had [presented] to the Mexicans,” said Volpe. The United States wants 40 percent of North American auto content to be sourced from areas paying at least $16 hour. “I imagine they’re trying to work out the Mexican feel for it with the new administration,” said Volpe. Guajardo was joined in Washington last week by Jesus Seade, whom Mexican president-elect Andres Manuel Lopez Obrador has tipped as his lead trade negotiator.